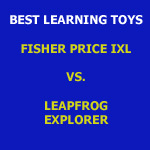 I’ve been comparing the Fisher Price iXL vs. Leapfrog Explorer and trying to decide which is the best learning toy for my kids? So I bought one of each for the kids this Christmas and spent some time this week setting up each device and installing games so that on Christmas day the kids can open the gift and start playing right away. 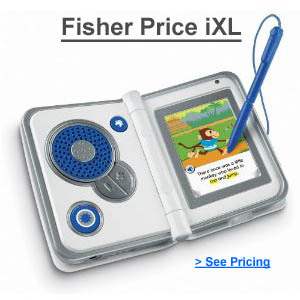 The iXL is a new device from Fisher Price. The LeapFrog Explorer is a brand new device that is really an updated version of the very popular Leapfrog2. Note that games are not cross compatible from the Leapster2 to the Explorer, so if you have an Leapster2 and update to the Explorer, you will be needing to buy new games also. If you do buy either of these systems, I do highly suggest that you open the box ahead of time and do all the setup. Both systems were fairly easy to setup, but it is a bit time consuming. With both systems you have to install their software and possibly download some updates. After that, you have the ability to customize the device with the child’s name and a few other customizations. On the iXL, they work in your child’s name and favorite color into things which is a nice personalization. On the Leapfrog explorer, having multiple user profiles is even more valuable. As you child progresses through the games and levels on the Explorer, the levels increase in difficulty. If you have multiple kids at different age levels who will use the device, having the ability for each of them to learn at their own pace is great. Next it’s time to install games. On the iXL, you install the games directly onto a hard drive built into the device and there’s an option to add an SD card for more storage. The Leapfrog Explorer is “cartridge” based, so it’s just one game at a time. The caveat there is that on the Explorer, you can download and install “Leaplets”. These are simple ebooks or game apps that can be installed on the device for some additional learning options. The Explorer comes with 1 credit to download a Leaplet and of course, you can buy more credits to download additional Leaplets. After setup, I played with each device for awhile to get a feel for how the kids will like it. The iXL has multiple ways that it can be used. They advertise that it’s “6 in 1” and I have to agree. The iXL feels more similar to an iPod Touch that is rugged and designed just for children. 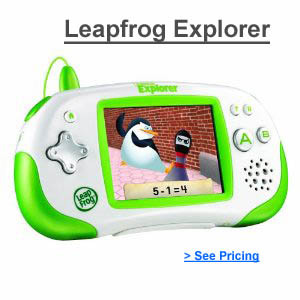 The Leapfrog Explorer is more similar to a handheld gaming device. It’s even laid out with buttons similar to a gaming controller with an “A” and “B” select buttons. The iXL 6 ways to play includes a photo viewer, ebook digital reader, game player, note pad, art studio for coloring pictures and mp3 player. You have the ability to upload your own photos to the iXL which kids will love to view and they can also then color on top of those pictures. So that’s a fun customization. Games also come with mp3 songs, but you can also load any song onto the iXL, so in that sense, it really does start to feel like an iPod for kids. The iXL is designed for kids 3 years old up to age 7. While the Leapfrog Explorer is designed for kids age 4 year old up to age 9. Both of these systems are great. So it just really depends what type of experience you are looking to provide for your kids. The iXL does many things (very much like an iPod for kids with book reader, games, coloring, music player and more). It is very easy to navigate, even for children as young as 3 years old. So for younger kids, the iXL will be the way to go. The Explorer is a bit more complex and is really a “hand held gaming device”. If your kids aren’t ready to jump up to a Nintendo DSi or similar handheld gaming device and you prefer that the games they play have educational value that Leapfrog is known for, then the Leapfrog Explorer is the way to go. It will be more interesting to older children who want more challenging learning games than the iXL can provide. We bought the iXL for our 3 year old and the Explorer for our 4 year old, but I’ve setup profiles for both kids on each device and expect that both devices will be a hit for each of them. So which one would you pick and why?